Sokollu Mehmet Pasha, also known as Mehmed Paša Sokolović, was born in Sokolovići, Bosnia. Recognized for his outstanding abilities, honesty and commitment to public service, he secured several important positions within the Ottoman administration, such as imperial chamberlain, chief treasurer, governor or beylerbey of Rumelia, navy admiral, and army commander. The Ottoman Empire was multicultural long before the term was coined. Measuring at its height almost twenty million square kilometers, it encompassed several non-Turkish majority regions. This included what is today Bosnia-Herzegovina, explaining the country’s rich Ottoman cultural and artistic legacy. Social mobility for non-Turks was possible largely through the institution of the devshirme in which young boys —particularly those from the Balkans— were recruited by the Janissary corps. They were then placed in special palace schools where they received an excellent education before being granted a role within the Ottoman administration. Among the Bosnians who rose to the highest ranks through the devshirme system is Sokollu Mehmet Pasha (1505-1579). Who is Sokollu Mehmet Pasha? Sokollu Mehmet Pasha, also known as Mehmed Paša Sokolović, was born in Sokolovići, Bosnia. Recognized for his outstanding abilities, honesty and commitment to public service, he secured several important positions within the Ottoman administration, such as imperial chamberlain, chief treasurer, governor or beylerbey of Rumelia, navy admiral, and army commander. It was, in fact, Sokollu Mehmet Pasha, who led the Turkish army campaigns against the Habsburg dynasty and cemented Ottoman victory at the famous Battle of Szigetvár in Hungary in 1566. However, he is best known for his long-standing career as grand vizier. From 1564 to 1579, Sokollu Mehmet Pasha served as grand vizier for three Ottoman sultans: Suleiman the Magnificent, Selim II and Murad IIII. The fact that he married Ismihan, the daughter of Selim II, reveals the level of trust that he had earned among the sultans, while equally underscoring the degree of political power that he wielded. A man of great wealth, Sokollu Mehmet Pasha was a formidable architectural patron who commissioned monuments throughout the Ottoman territories, including in the holy cities of Mecca and Medina. The Grand Vizier never forgot his native land where many of his commissions are still extant. The Mehmed Paša Sokolović Bridge in Višegrad that UNESCO has classified as a World Heritage site is the most famous. Built by Mimar Sinan in 1577, the 179.5 meter long construction with its eleven monumental arches is a feat of both engineering and artistry. Among other monuments in Bosnia, the grand vizier also sponsored bridges in Sarajevo and Trebinje, a castle located between Sarajevo and Višegrad, and a mosque, primary school and guesthouse in his hometown of Sokolovići. The complex was built on a steep slope. 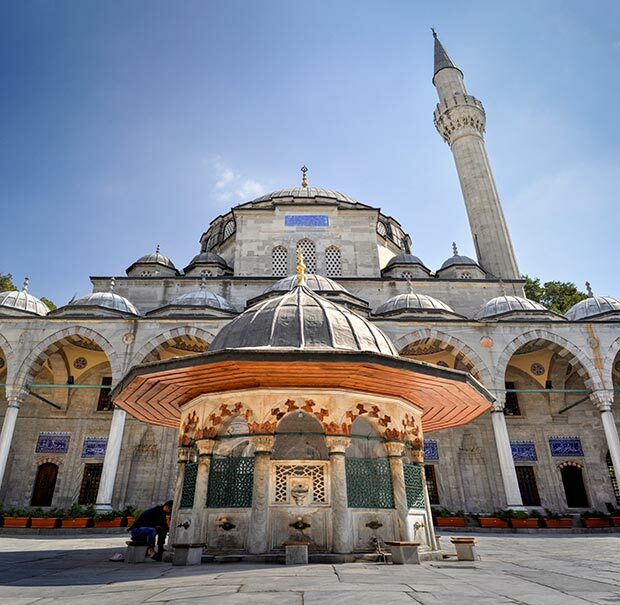 Sinan solved the problem of uneven terrain by making the part of the complex in front of the mosque two stories high. The first level once contained small shops, while the second level bore the madrasa and courtyard still standing today. Three sides of the courtyard form the madrasa. They carry behind their arcade the small domed cells that served as student lodging, while directly above the main entrance stairway and opposite the mosque’s main portal is the large domed room that served as the dershane or main classroom. Between the mosque and madrasa, an elegant cupola-covered dodecagonal marble ablution fountain marks the courtyard’s center. The architectural design of the courtyard that houses different structures and spaces of varying functions and heights is harmonious, reflecting the high quality of Ottoman architecture in the second half of the 17th century. The mosque is located on the fourth side of the courtyard. The façade’s design and decorative elements —niches, calligraphic ceramic panels, muqarnas capitals— display the classical Ottoman style. The form of the Sokollu Mehmet Pasha Mosque can be best described as a hexagon inserted into an almost square rectangle (18.80 x 15.30 m). A dome, 13 metres in diameter, tops the single prayer room with its attractive upper gallery, while semi-domes enable the smooth transition from cube to circle. The kalem işi or painting in the dome dates from a much later period. Extremely little original painting has survived, apart from a small sample of rich and colourful designs found above the entrance portal. 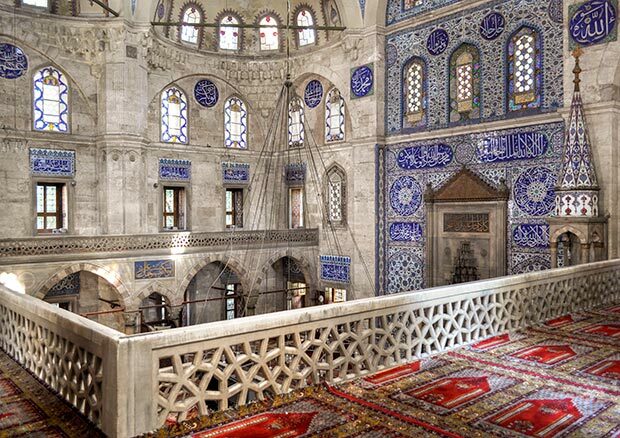 Like the best Ottoman mosques, however, it is the 1572 construction’s spatial and visual unity that testifies to its artistic and expressive power. The design’s successful marriage of opposites displays nothing less than artistic genius. The weight of monumentality is counterbalanced by light —there are more than ninety windows—, as well as by delicate and profuse ornamentation. The neutral colour and sobriety of stone couples with polychrome decoration, whether that of ceramics, stained glass or painting to produce an impeccable harmony that further weaves seemingly disparate elements into a single masterwork. Four small pieces of the Black Stone are inserted into different places of the mosque’s interior, but they are only visible by the small gold rectangular painted frames that surround them. The most spectacular aesthetic element of the mosque interior is unquestionably the ceramic decoration. Iznik ceramic tiles sheathe the pendentives of the dome, the small floral panels under the galleries and the rectangular and circular calligraphic panels above and between windows. While the inscriptions possess a religious function, overall, these areas of ceramic decoration are small and serve a second function as unificatory extensions of the large central bay of the southern mihrab wall, which is completely clad in floral and calligraphic ceramics right up to the base of the dome. Even the conical spire of the minbar carries Iznik tiling. The central bay of the southern wall of the Sokollu Mehmet Pasha Mosque constitutes one of the most exquisite mihrab walls found in Ottoman architecture. Not only do the tiles date from Iznik’s technical and artistic apex, but the arrangement around the marble mihrab in which flower and saz leaf patterns are interspersed with dramatic white-on-blue inscriptions evinces the superb artistic skills of the designer. The floral decoration is multicoloured, but cobalt blue remains the overarching hue of the composition. The ceramic oasis marking the qibla cools the eyes and quiets the soul. Its beauty serves not only an artistic purpose, but also acts as a visual metaphor for the spiritual comfort and possibilities that the human heart experiences when it connects with the Divine.